I’ve always been a golden jewellery type of gal. Even my very first earrings (my mum had my ears pierced when I was so little that I can’t even remember it – good on her, I’d faint if someone approached my ear with a needle now) was gold (actual gold in this case). 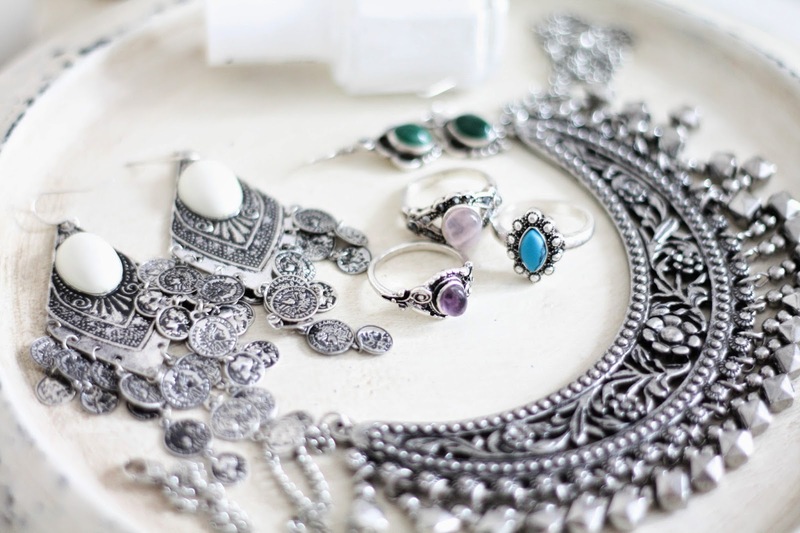 Lately though, with a revamp of my wardrobe, I’ve been really drawn to silver toned boho jewellery (or tribal, Bali, tarnished silver, Greek coin, whatever you want to call it). Since I’m taking a break from over-collecting (read hoarding) things at the moment (there’s a chance I’ll be moving soon so I’m on a vibe of just-in-case downsizing of everything! 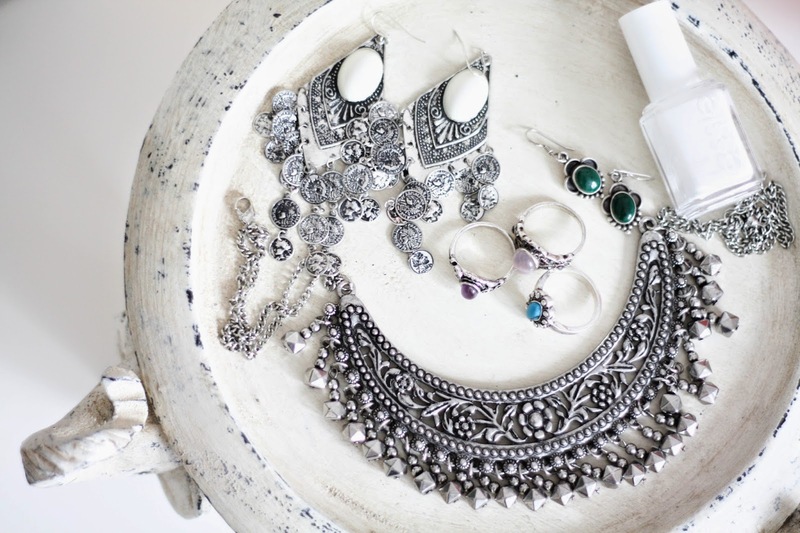 ), my stash of this boho jewellery trend is not exactly immense. My current favourite statement necklace (read about my whol collection here) is from Primark (they should still have it as it’s a recent purchase) and cost only £4, which I think is an absolute bargain for how classy it looks – the floral detailing in the centre makes it look much more expensive, I think. The large dangly coin earrings are also from Primarni – but these were on sale and cost just a quid! BAM! 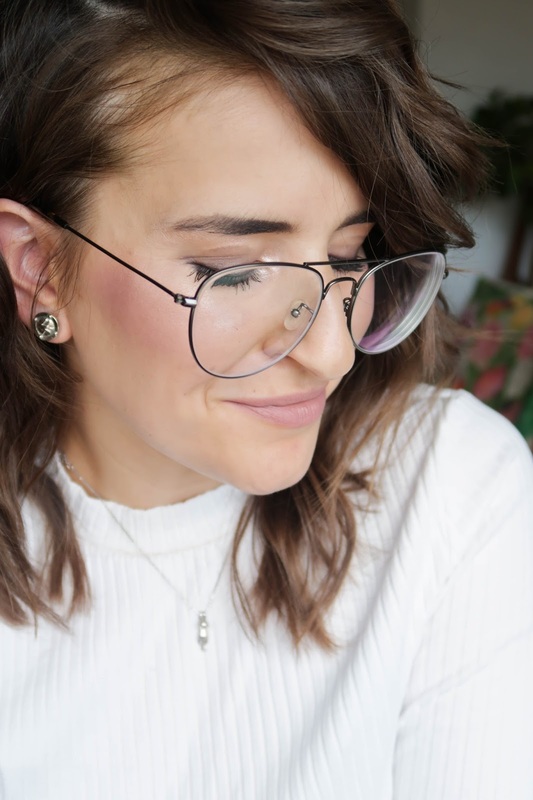 I’ve got another pair which I can’t wear as I find it too heavy on my earlobes – but this one is super light and you can’t even feel it when wearing it! Those little green earrings are actually quite a nostalgic item. I bought them in Italy when I was there with my best friends back in.. wait for it.. 2005? Oh dear God. That’s like 9 years ago! I remember buying them at this local market at St Benedeto (I think hat’s how you spell it – any Italians here? Haalp?) for something ridiculous like 4 euros and they are made of sterling silver. It also reminds me that I got my mum a pair too, might need to rummage through her jewellery drawer, haha! Finally – the rings. I’ve been on a hunt for sterling silver rings for God knows how long. But I just can’t seem to find any nice ones. These are from Topshop and the set cost £10 – unfortunately they are not real silver, however (*touches wood*) they are still going strong and haven’t started turning my fingers mouldy green yet. Where would you recommend I have a look for sterling silver boho jewellery?